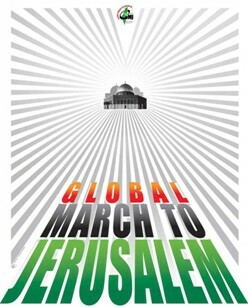 The Global March to Jerusalem (GMJ) is a groundbreaking new initiative that is organising non-violent civil resistance on 30th March 2012 in Palestine and the four neighbouring countries: Egypt, Lebanon Jordan and Syria. The GMJ is comprised of a diverse coalition of Palestinian, Arab and international activists who are united in the struggle to liberate the holy city of Jerusalem (the city of Peace) from illegal Zionist occupation. The peaceful marchers will demand freedom for Jerusalem and its people. Our aim is to end the Zionist policies of apartheid, ethnic cleansing and Judaisation, which all harm the people, land and sanctity of Jerusalem. Judaisation has involved the unrestricted expansion and funding of illegal Israeli settlements, the continued dispossession and demolition of Palestinian property, and the construction of a Separation Wall surrounding the city, all of which have changed the demographics of the holy city from a Palestinian to a Jewish majority. Global participation in the march will confirm to the world that these racist policies and practices of the state of Israel against Jerusalem and its people are a crime not only against Palestinians but against all humanity. The march will unite the efforts of Palestinians, Arabs, Muslims, Christians, Jews, and all citizens of conscience in the world to put an end to Israel’s disregard for international law through the continuing occupation of Jerusalem and the rest of Palestinian land. While the GMJ is made up of grassroots movements in each participating country, the march is centralized through an International Central Committee, consisting of 42 elected regional delegates. Regional delegates will appoint 15 members for the International Executive Committee and recruit hundreds of dignitaries and luminaries for the International Advisory Board. Our plan is to organize massive marches towards Jerusalem, or to the nearest point possible according to the circumstances of each country, in Palestine (the 1948 Zionist land seizures, the West Bank and the Gaza Strip) and the four neighbouring countries: Jordan, Egypt, Syria and Lebanon. Internationals will participate in land caravans or fly directly to one of the main sites for the march. In addition, mass protests will be organised in front of Israeli embassies in the capitals of different countries, or in the main public squares in the big cities of the world. The recent successes of the Egyptian and Tunisian revolutions are a reminder that this inspirational movement for nonviolent civil resistance was actually born in Palestine with the first Intifada. By renewing the struggle to liberate Palestine through a peaceful national mass movement that is supported by the global community, we aim to change the nature of the confrontation by compelling the occupiers to face millions of demonstrators demanding Freedom for Palestine and its capital Jerusalem. The historic day 30th March marks Palestine Land Day* in Palestinian national memory. This year our aim is to mark it as an international event to demonstrate solidarity with Palestinians and to protect Jerusalem. This will be achieved by organizing a Global March to Jerusalem or to the nearest point to it. The march will demand freedom for Jerusalem and its people and to put an end to the apartheid, ethnic cleansing and Judaisation policies affecting the people, land and sanctity of Jerusalem. By organising the March and its preceding and parallel activities we aim to highlight the cause of Jerusalem (the City of Peace) which is considered the key to peace and war in the region and the world. The march will confirm that the racist policies and practices of the Zionist state of Israel against Jerusalem and its people are a crime not only against Palestinians but against all humanity. We aim to make this march a turning point in the nature of the confrontation, with the occupation having to face millions of protesters and demonstrators demanding freedom for Palestine and its capital Jerusalem. We will make a renewed true effort towards ending the occupation through peaceful national movements inspired firstly by our convictions, secondly by the justice of our cause, and thirdly by the spirit of the Arab spring revolutions and the determination of young people who were able to overthrow dictatorships. Especially now that the nations have realized the magical effect of the people’s will to make the impossible possible. The advancing slogan, “the people demand,” has proved to be more effective than armies and weapons. What is the structure and who is behind this project? To achieve all the above the idea was turned into action by forming an International Central Committee (ICC) responsible for this march. The committee consists of 42 members representing the five continents. An International Executive Committee (IEC) for the GMJ will emerge from the International Central Committee, and will consist of 15 members. National committees in most countries of the world will be formed to follow up and to coordinate the actions and events at the national level. These national committees will include representatives of all backgrounds and organisations working for Palestine and Jerusalem from media, religious, social, professional and human rights figures. There are dozens of international figures worldwide adopting the idea, supporting and signing a document of principles governing the Global March to Jerusalem. This document was adopted at the founding meeting in Amman on 12th December, 2011. Among the prominent, well known figures who sign the document of principle an Advisory Board will be formed. The complete list of names on the Advisory Board along with all organisations supporting the GMJ will be announced shortly to emphasize the international support for the march. * Palestine Land Day – a day celebrated by Palestinians on 30th March each year. The event marks the events of March, 1976, after the Israeli authorities confiscated thousands of dunums of private and public land in majority Palestinian areas, especially in the Galilee. Following these events the Arab masses inside Palestine declared a general strike, confronting the Israeli authorities for the first time since the occupation of Palestine in 1948. The Israeli response was militant and violent, as the Israeli troops, backed up by tanks, entered Palestinian villages and reoccupied them, causing a number of martyrs and many wounded and detainees among the civilians. We are now in 2012, and we are still living in exile or under the Israeli apartheid regime, the illegal construction of colonial settlements is confiscating the remaining parts of Palestine, the Separation Wall divides and separates villages and towns, and Palestinians in Jerusalem are threatened of being driven out of their homes and lands for the mere purpose of the Judaization of this sacred city. But we will not leave. We will stand and be firm. We will not permit thousands of years of our attachment to our land and our Holy City to be broken. We therefore invite and call upon all persons of courage and good will around the world to stand up and walk, with your fellow human beings, regardless of religion, of political affiliation ñ to stand up as responsible human beings and walk peacefully towards Jerusalem on the 30th of March, 2012. We therefore ask all our brothers and sisters throughout the world to join Palestinians on Land Day, 30 March, 2012 in challenging the barriers, borders and procedures that separate Palestinians from Jerusalem and from their homes and lands in all of historic Palestine. How will the march towards Jerusalem take place? 1. Massive marches will be organised from Asia, Africa and Europe to and in neighbouring countries to Palestine (Jordan, Eygpt, Syria and Lebanon) and towards Jerusalem or to the nearest point possible according to the circumstances of each country and through coordination between all groups and institutions of civil society taking part in the march, in coordination with the official and national bodies concerned. These marches will be composed mainly of the people of each country and thousands of international solidarity participants traveling to these countries specifically to join the marches. Massive marches will be organized in Palestine (the 1948 seizures, the West Bank and the Gaza Strip) towards Jerusalem or to the nearest point to it. Palestinian people from all factions and institutions will participate alongside international solidarity activists who are able to enter Palestine. Mass protests will be organised in front of Israeli embassies in the capitals of different countries. Mass demonstrations and protests will be organised in the main public squares in the big cities of the world, including the Arab and Muslim capitals and large cities, which can be initiated from the main mosques and churches in each city, where appropriate. Transcontinental rallies will be organised, from Europe, Africa and Asia, according to the conditions and possibilities of each region. The Global March to Jerusalem is focusing on the particular issue of Jerusalem because the holy city embodies the terrible violence of an enduring occupation. Furthermore, the security of Jerusalem as a city for all of humanity is especially urgent today. Over the last several years Zionist efforts to “Judaise” the city have quickened pace in an attempt to erase Jerusalem’s physical, cultural and spiritual characteristics. This process of Judaisation includes the unrestricted expansion and funding of illegal Israeli settlements, the continued dispossession and demolition of Palestinian property, and the construction of a Separation Wall surrounding the city, all of which have changed the demographics of the holy city from a Palestinian to Jewish majority. These apartheid policies target and exclude not only Muslims, but also Christians. Over the last twenty years government backed fundamentalist Jewish groups have taken Palestinian homes in both the Muslim and Christian Quarters of the Old City. Recently Jewish Settlers attacked a Jerusalem monastery that was built on the site where tradition says the tree used in the making of Jesus’s cross once stood. The monastery was defaced with “death to Christians” graffiti in Hebrew. On the same day “death to Arabs” was also painted on the wall of a playground of a Jewish-Arab bilingual school in Jerusalem. According to 2011 report by Richard Falk, the United Nations Special Rapporteur on the occupied Palestinian territories, “the continued pattern of settlement expansion in East Jerusalem combined with forcible eviction of long residing Palestinians are creating an intolerable situation that can only be described, in its cumulative impact, as a form of ethnic cleansing.” However the United Nations and other international bodies have done little to prevent this Zionist aggression. In response, Palestinians are calling upon the global community to secure the status of Jerusalem as a Holy City for all humans. • We assert the importance of Jerusalem politically, culturally and religiously to the Palestinian people and humanity as a whole. We call for the protection of the Holy Places and all archaeological sites and consider all the efforts done to change its Arabic & cultural identity as a crime against humanity. We call on all international institutions to do their duties towards the city. • The defence of Jerusalem and its liberation are a duty of all free people around the world and we call on all institutions, organizations, and individuals to participate in this duty. • We condemn the Zionist campaign of ethnic cleansing in Jerusalem and the rest of Palestine including all ongoing policies intended to change the demographic and geographic situation in the city and aimed at its Judaisation. We also condemn the continuation of the Zionist occupation forces in building the apartheid wall that aims to expropriate more Palestinian lands and convert the occupied areas into shrinking cantons isolated from each other. • We support the right of the Palestinian People for self determination and to liberate their lands and to live on them in freedom and dignity like all other people on earth. We support the non-negotiable & inalienable rights of the Palestinian People including their families to return to their homes and lands from which they were uprooted. We reject all racist laws that distinguish between people based on ethnicity or religion and call for their cancellation and criminalization. The Global March to Jerusalem does not represent any one faction or political party but we call for participation of all social forces, political factions, and ideologies. The Global March to Jerusalem is a global peaceful movement which does not use violence to achieve its goals.